Want the BEST RATE possible? A 15-Year fixed rate provides a lower interest rate than the 30-year fixed rate mortgage. Looking for the LOWEST monthly payment? A 30-Year fixed rate mortgage provides a lower monthly payment than the 15-year fixed rate mortgage. A fixed rate mortgage gives you a fixed monthly mortgage payment for the term allowing for easier budget planning. Learn More about Fixed Rates! Want to Buy a Home with ZERO DOWN PAYMENT? If you are a Veteran, VA loans are a great option! VA loans have no mortgage insurance and require no down payment! USDA loans are a great option for eligible properties. 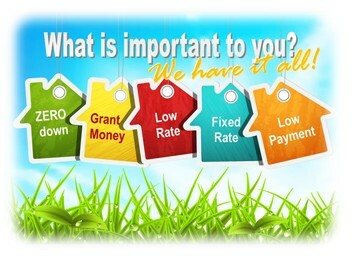 USDA will finance your closing costs and require no down payment! Learn More About our VA Options! Learn More About USDA Options! Local bond purchase options provide a great avenue for potential home buyers! Learn More About Local Bond Options!